The Jade Spa Collectionâ„¢ provides some of East Asiaâ€™s most coveted beauty and longevity formulas and rituals handed down through a family generation â€“ exclusively for leading spas, clinics and their clients. Jade Spa is committed to opening the doors to the wisdom and practices of ancient royalty. Jade Spa (Jadience) stands apart as a purely natural company that incorporates the science of herbology with tightly guarded internal and external formulations, which feed and detoxify the skin and body to the core. Each of Jade Spa's renowned rituals & treatments contain the highest possible levels of all-natural organically grown and ethically wild harvested herbs synergistically combined with the incredible power of the Jade Stone. Jade Spa products are hypoallergenic and non-comedogenic and are free of parabens, pthalates, mineral oil, alcohol, color and dye. This therapeutic, skin-softening treatment is perfect for rough, dry and cracked feet. This exclusive therapeutic formula hydrates, nourishes and protects dry, overworked hands and feet. 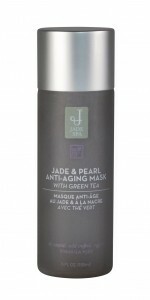 This powerful anti-aging gel mask contains pure jade and mother of pearl powder, which are powerful minerals known to firm, lift, brighten, and stimulate cell regeneration. Exfoliation is critical for anti-aging and maintaining the overall health of the skin. This proprietary formula consists of Jade Powder, Mother of Pearl, Green Tea, & UGL Complex to lift away dull, dead skin cells to instantly reveal younger-looking skin. The powerful, proprietary blend of East Asian herbal ingredients, including Achyranthis, Corydalis and Clematidis, improves circulation, relieves pain, aids in the relief of swelling and inflammation and increases strength, all while removing toxins and internal bruising. The herbal Pain Relief Patch helps reduce swelling, increase circulation and remove toxins while restoring chi (vital energy) to the area being treated. This powerful formula helps to relieve muscle and joint discomfort and aids in the recovery of muscle and joint stress.